A Little History: The Debut of "No Noise"
Older music recordings frequently have problems that have nothing to do with background noise. If the microphones used had poor frequency response, or the disc cutters weren't set up right, or for a dozen other reasons, the tonal quality of historic recordings can be sadly lacking compared to modern recordings. Conventional EQ methods do not help this situation much. Can anything be done about that? What does one do about unwanted noises that cannot be defined as a click, pop, or continuous steady-state noise? If you have an audience cough during a soft music passage, or a car horn spoiling a location film take, is it possible to separate out and eliminate such noises? As it turns out, these problems can be addressed, and affordable software is available now that does just that. The first problem, the poor tonal quality of many historic recordings (or contemporary recordings made incompetently), can be addressed with a software program called Har-Bal, which is short for the term "harmonic balancing". I'll address the other problem, the removal of discrete noises, in part 2. "Harmonic Balancing provides a reliable means of correcting for and removing the tonal imbalances inherent in any song, producing a more agreeable sound to the listener....Most of the time we are unaware of the cause but Har-Bal gives you the ability to see it and take steps to correct for it....We handle the problem by first analyzing the entire recording. This gives us a measure of the average and peak spectrum content (displayed graphically) from which we can quickly and easily judge the spectral balance of a given recording. Then through a novel user interface, our software allows you to design a matching digital filter that produces the spectral balance you want...."
For the full, blow-by-blow description, I recommend going to the Har-Bal web site and perusing their manual and tutorial. However, be aware that the technique I am going to describe here goes somewhat beyond the original intent of the Har-Bal software. The makers of Har-Bal intended for it to be used to equalize pop recordings in mastering situations. Among the techniques available is the ability to compare the EQ spectrum of a known reference recording with the recording you are working on, and to modify your recording to be more like the reference. However, the exceptionally flexible EQ filter of Har-Bal, combined with a graphic display that has resolution of up to 1/12 of an octave, allows for this process to be taken farther than you would normally think possible or desirable. In the case of historic recordings it is possible with Har-Bal to, essentially, reverse engineer the tonal qualities of the recording, as imparted by the original microphones, electronics, disc cutters or tape recorders, etc. When this is done properly, the improvement in the sound of a given old recording can be jaw dropping--we are not talking about subtle here. This use of Har-Bal was originally discovered by Andrew Rose, a former BBC radio engineer. Rose had started his own audio restoration company, specializing in cleaning up and improving the sound of historical music recordings. Back in 2007, he was struggling with trying to make a 1936 Toscanini recording of Beethoven's Seventh Symphony sound other than terrible. Out of sheer frustration, he tried using an early version of Har-Bal to match the equalization of the 1936 Beethoven recording to a good, modern recording of the same piece, as exactly as he could. According to normal audio thinking, this is not a good thing to do, as the resulting EQ curve will be terribly jagged and extreme and should sound quite bad. But in this case, the sound Rose heard was a remarkable improvement. It seems that if you use the right reference model and match it precisely, the sonic curtain veiling the past really can be lifted. Rose's company has since morphed into Pristine Classical, a music download web site specializing in the sale of historical classical music recordings rejuvenated by Har-Bal and other techniques, as applied by Andrew Rose, Mark Obert-Thorn and other engineers. Graph 2: Here we see the traces for the reference recording, superimposed over the traces for the restoration recording. I did not have a modern recording of Walton's The Quest available, so I used instead a recording of a piece with similar instrumentation, Brahms Hungarian Dance No. 6, as my reference. This particular recording was made in 1960 and features the Vienna Philharmonic directed by Fritz Reiner, as recorded by British Decca (known in the U.S. as London Records). Decca was making remarkably good master recordings in Vienna at that time, and the CD issue of this recording sounds very fine. 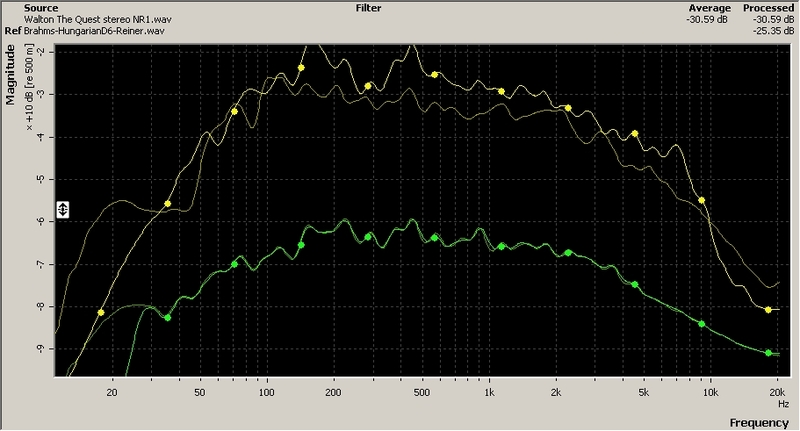 We can immediately see the difference in frequency profile between the two recordings--the increased bass response of the reference is very evident. Graph 3: Har-Bal contains an algorithm that can do an approximate match between the primary recording and the reference. That is what we see here. Still, the algorithm is less effective at the frequency extremes, and the overall match is, indeed, approximate. Graph 4: Here I have matched the reference EQ trace nearly as precisely as I can, using manual adjustment via the equalizer "gain" cursor (essentially a very flexible parametric control). Another ten minutes of mousing and I could probably get it even better, but this is sufficient for our purpose here. 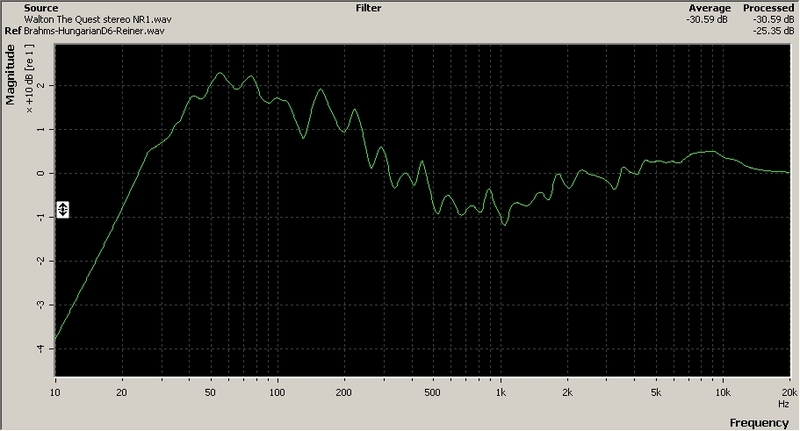 Graph 5: Here is a display of the frequency response of the filter created by all my mousing about. 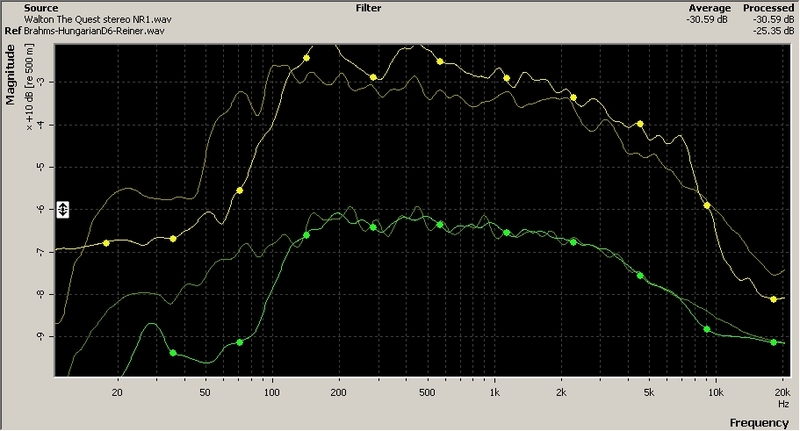 Note the 20 dB peak in the bass and the overall jaggedness of the curve--no responsible engineer would deliberately use an equalizer to create this kind of curve for any normal audio purpose. It's just "wrong" to do this, isn't it? As they say, the proof of the pudding is in the eating. Below are links to two MP3 files, one of the original recording, the other after a Har-Bal curve like the one we see above was applied--along with a 60 Hz notch filter and a couple of passes of broad-band noise reduction. Given the radical EQ boost being used, the noise reduction was essential. OK, you've heard the recordings. The difference between before and after Har-Bal processing is pretty remarkable. As for why this process works as it does, Andrew Rose has pointed out that what makes old recordings sound "old" is not just noise and distortion, but also some rather severe frequency response errors, caused by the microphones, amplifiers, disc cutters and associated equipment of the time. If you could draw a graph of the accumulated errors in say, a 1928 electrical recording, you would likely end up with a plot of a landscape quite different from good, modern recordings, with some really remarkable peaks and valleys evident. Trying to correct for all of this via the equalization practices we normally use today is simply inadequate to address the various problems--it's not a matter of tweaking a little here and there, really radical EQ is needed. Har-Bal gives us a practical way to accomplish this, and so it is a real step forward in dealing with restoring historical recordings. On May 12, 1968, the choir of St. Paul's Chapel, Columbia University, gave their annual May Festival Concert, with orchestra and soloists, all conducted by their musical director, Searle Wright. As was his custom, Mr. Wright presented an extraordinary variety of music, including William Walton's suite from his ballet score "The Quest", which was a feature for the orchestra, sans choir. Walton's music for "The Quest" was written in 1943, but it had never been performed in any form in New York until this 1968 concert. Due to the student protests occurring on the Columbia campus at that time, the concert was not presented in St. Paul's Chapel, but in the South Hall of Riverside Church, a meeting hall that was also used as a cafeteria. (I believe some of the background noise on the original recording is the sound of refrigeration equipment.) The tape of the concert was brought to me by Tom Baker, who had sung in the choir on that occasion and also made the recording with his own equipment. Due to his duties onstage, he required the help of a friend to turn the tape machine on and off. The excerpt I have presented here is used with Tom's permission, for which I thank him. I would characterize the original recording as rather bright and "forward" sounding, with a lack of deep bass. After awhile, it becomes fatiguing to listen to, as the excessive upper midrange energy tires the ears. My revision tames the upper midrange and restores the low bass. The acoustic bass sounds more even up and down the scale and you can hear much more clearly what the drummer is doing with his kick drum. Next: In part 2, we will look at "spectral repair", which can remove unwanted noises from recordings that were previously impossible to remove without damaging the desired sound.